In this comedy short, legendary director Steven Spielberg is overcome with doubts about his latest epic. Out of desperation, he turns to an otherworldly source of inspiration — in his shower. Will he get his big idea, or a whole lot more than he bargained for? 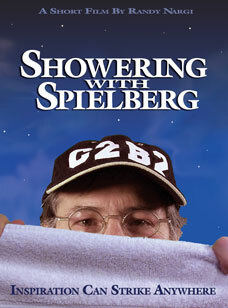 SHOWERING WITH SPIELBERG was conceived, written, cast, shot, edited, and scored in less than 30 days. As the title suggests, the film takes place in a shower, which presented a number of production challenges. How do you prevent the camera’s lens from fogging? How do you record clean audio? How do you avoid electrocuting the cast? We managed to shoot the entire film in one long day with six people confined in a 4′ by 5′ shower — along with lights and equipment. Needless to say, we’re all on much more intimate terms now. Another big production challenge came during post-production. We use a fair amount of compositing and some digital effects and these all had to blend well with the live shots to create the reality of the situation.